The annual Tierney Fellowship workshops were held at Michaelis in February. 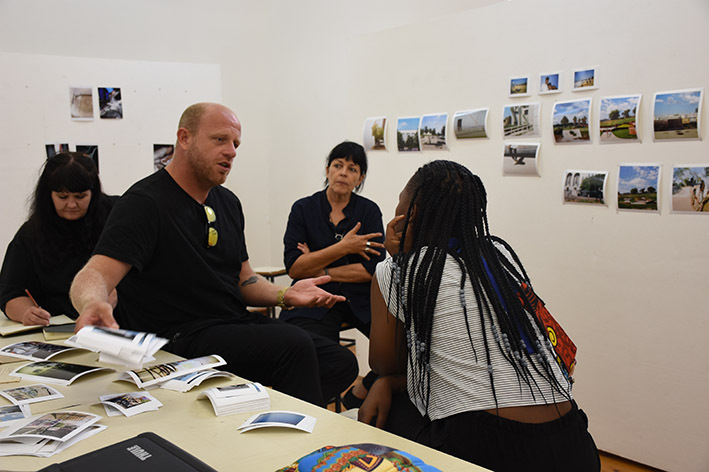 Our colleagues from Market Photo Workshops and WITS came to Cape Town and our invited guests were artists Pieter Hugo and Jo Ratcliffe and academics Dr Nomusa Makubu (from UCT Art History and Discourse of Art) and Prof Adam Haupt (UCT, Film and Media Studies). Previous Tierney Fellowship recipients Nobukho Nqaba, Lauren Theunissen and Sitaara Stodel came to mentor the students and “play it forward” to give advice on the fellows work and to talk about the experiences and insights they gained as fellows. We had some fascinating discussions about photography around some strong work. We are particularly proud of the Michaleis Tierney fellow for this year, CJ Chandler who is producing a beautiful book loosely linked to his hometown Grahamstown. We continue to be so thankful for this partnership with the Tierney Family Foundation which has yielded such richness for our students and institutions.